How do I save my Markdown as HTML including all of its styling and formatting so I can view it later offline? In this post I discuss a tool that packages HTML into self-contained HTML packages. This is roughly the same behavior as what most browsers with Save as HTML, but as a standalone feature that can be integrated into an application or scripted from the command line. You can see the 3 options from the packaging library, as well as raw output. Raw Output is very simple as it simply renders the Markdown and either dump it to a file on disk, or onto the clipboard. Markdown by itself produces only an HTML Fragment rather than a full blown HTML document natively, so raw output from Markdown is just a block of raw HTML without an HTML document header or any sort of styling associated with it. Styling of the Markdown HTML display is not determined by the Markdown itself, but the hosting HTML page into which the rendered HTML is embedded. It works but it's nothing like what you'd expect to see if you want to read the HTML document. In order for the HTML output to be useful it generally needs to be embedded into a host document that provides the overall page layout and styling. For example, when you go to GitHub and you see a README.md file, GitHub actually renders the Markdown into an HTML page. What you see on GitHub is the rendered Markdown HTML embedded into GitHub's Web Chrome that makes up chrome of the HTML page. The Github page header, repository details etc isn't part of the Markdown - that is provided as part of the hosting application that embeds the rendered Markdown into the page. Likewise in Markdown Monster the application previews Markdown as HTML in the Previewer by first rendering the Markdown into HTML, and then merging the raw HTML into a pre-designed preview template that provides the appropriate styling. In MM you can switch between a number of different templates, modify an existing one or create a new one. In all cases it's the template, not the rendered Markdown that determines the page styling of the rendered HTML output. Raw output may be OK if you are just pasting the HTML output into an existing HTML page which BTW can be useful if you're editing large blocks of static HTML text. But for any sort of display purposes you almost always want to merge the raw Markdown generated HTML into host document. To be useful on its own, Markdown has to be either rendered into some other document format or the HTML has to be merged into a host template to make it look properly. PDF output is popular because it provides an easy way to create a packaged document that's relatively small in size. With PDF viewing built into modern browsers this can be a good choice and Markdown Monster provides that option as well via Save As Pdf. PDF output works but it too actually has to render to HTML first and then has to be converted to PDF from HTML. In Markdown Monster I use wkHtmlToPdf which is a command line tool that uses Chromium to render HTML and then turns it into PDF files. This works surprisingly well. The nice thing about PDF is that it's fully self-contained - all images, styling and formatting is rendered right into the PDF and it only pulls in what is actually on the page. On the downside PDF is not a plain text format so it's not indexed as well as HTML, and maybe more importantly PDF content on the Web generally renders separate from your Web site - you can't really make PDF content behave like other integrated HTML content, but rather you have to rely on some sort of viewer to host the PDF. That's both a good and bad thing depending on the use case. For later viewing the separateness is a benefit, but for integration it is not. 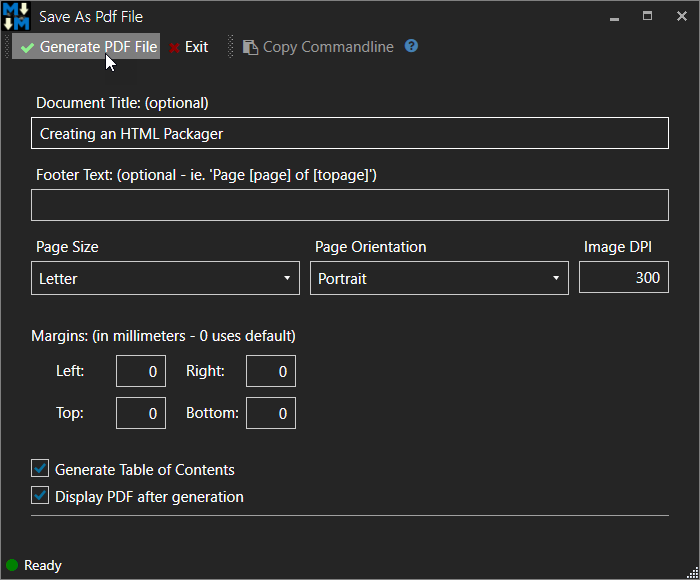 As nice as PDF output is for documents and sharing, sometimes you want HTML output that can be viewed with the original HTML fidelity or perhaps you want to take a document that you've written and re-use it on your Web site with all the formatting from the preview template intact. For that to work you have to be be able to turn an HTML document into a package that you can copy. One of the strengths of HTML is that makes it really easy to create distributed documents that merge content from many different sources. It's not uncommon for Web pages to contain HTML content from many Web sites - your CSS style sheets and scripts may come from a CDN, while your actual HTML and custom styling lives on a local Web Server. In Markdown Monster I preview Markdown into HTML documents using a template. The output is generated to a local file which is then previewed in the browser. But templates are user customizable and users can and do create custom templates that often pull in styling from their Web sites for example, so that the preview matches their live site's layout and styling. In order to save either online or local content in an offline format all the dependencies have to be respected and properly packaged. So, in order to do this I created an HTML Packager project. The idea of the library is pretty simple: You can point the packager at any URL or local HTML file and it'll try to parse the HTML document into all of its component parts. The easiest way to try this out is using the Console app. The app is a Windows console app compiled into a single ILMerged executable. The first produces a potentially very large fully self contained document. The document embeds all css, scripts, images, url() resources directly into the document. css is embedded as raw text, script, images and other resources are loaded and embedded as base64 binary expressions directly in the document. As you might expect, binary dependencies like images and fonts can make this file very large, but it ends up being fully self contained as a single file which is nice. The other option is a normal HTML file that re-routes all related depdency resources into the local folder as a local resource. 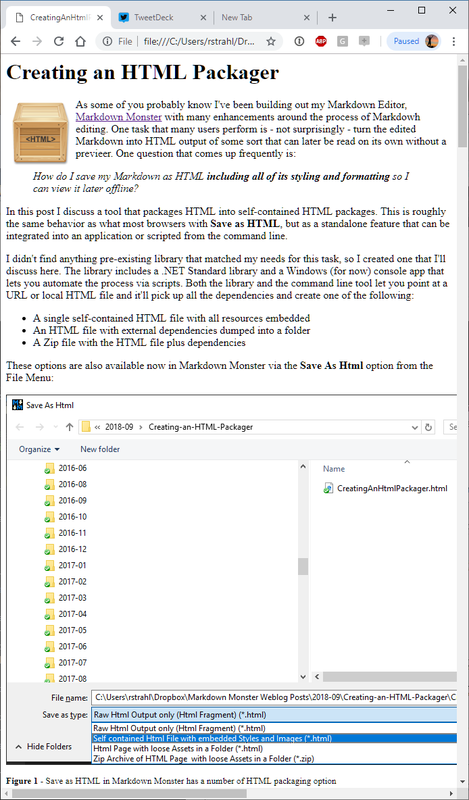 If you don't provide the -x or -z parameters, HtmlPackager creates that single, large, self contained HTML file. The following are a few examples you can try to capture output. Captures to a single self-contained, large HTML file with all resources embedded. Captures an HTML file and dumps all related depedencies into the same folder as the HTML document. Same as the latter, but packages the final output of HTML plus depdencies into a Zip file. The implementation of this packager is fairly straight forward. 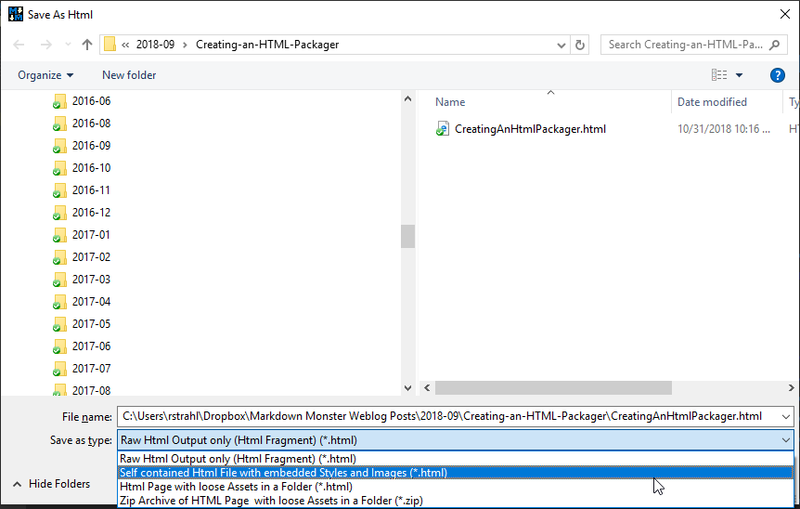 The library uses HtmlAgilityPack to parse the HTML document and essentially looks for any resource links and tries to localize them either by embedding them into the document directly, or by writing them out to file in the same folder as the HTML document to be saved. All dependency links are re-written using a relative path to the new local files. You can check out the code on GitHub. It's a pretty rough, "just get 'er done" implementation, but it seems to work well for many URLs I've thrown at it. I'm sure there will be things that don't work, but if nothing else this code base might be a good starting point for more complex scenarios. 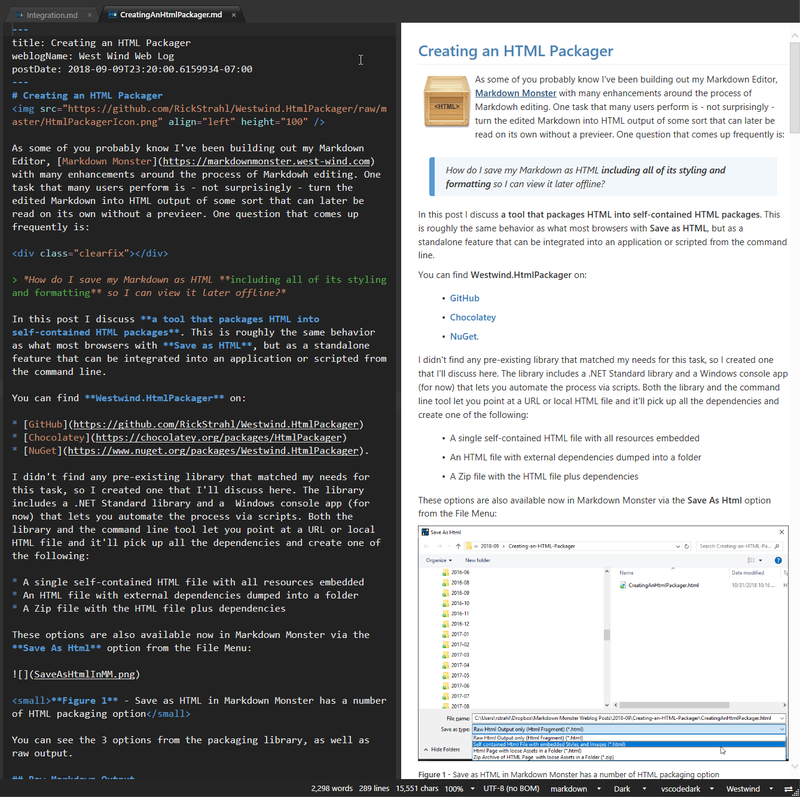 My initial goal was of course for rendering Markdown documents out of Markdown Monster and it does well for that - there's no problem converting the Preview generated Markdown into easily portable HTML documents. For Documents - Not SPAs! I know something like this will ultimately used in all sorts of weird situations, but keep in mind that my goal for this was to basically duplicate the Save As HTML features available in browsers and the goal of that tooling is to be able to capture document centric content. For this the HTMLPackager should work well, but it won't work for more complex scripted applications or full blown SPAs. You might be able to get to the first page (or whatever resources are initially loaded) but the dynamically loaded content will not be picked up by this tool. It would be nice to build this thing into a cross platform tool, by adding a .NET SDK Global Tool implementation. I haven't played with that functionality yet, and this might be a good use case to try out playing with that tooling. I have to say that a Windows Console app still sounds a lot more user friendly though 😃 I'll leave that excercise for another late night play project that I can blog about.